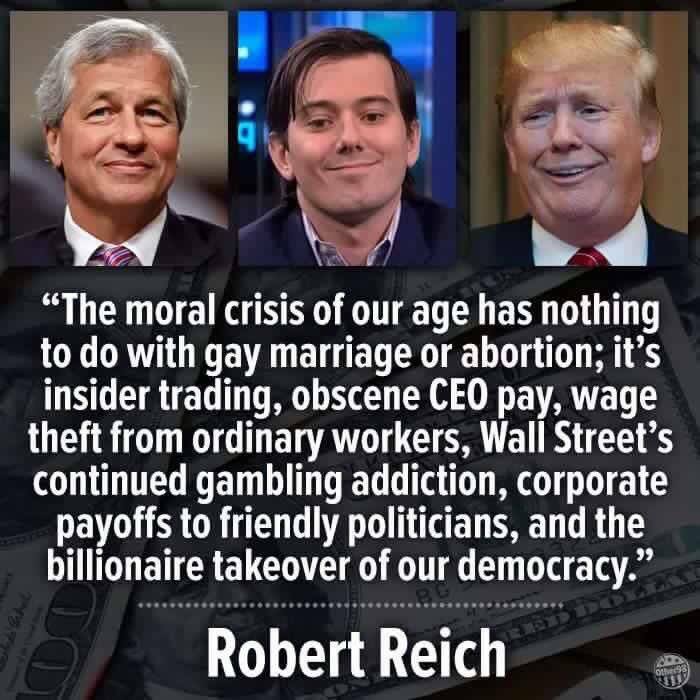 The problems of rampant greed and psychopathy that Robert Reich has expressed in tonight's meme have certainly existed throughout the history of humankind. That, of course, includes our country, especially during the robber baron period of the later 19th century. This disease has never gone away, but the likes of those in charge right this moment, from Jamie Dimon down to lesser corporate scum like Martin Shkreli and, on the political front, Señor Trumpanzee, Paul Ryan, Mitch McConnell, and Chuck Schumer, just to name a few, will always do their best to keep the disease alive. That's especially easy to do when you pull the levers of the most powerful country on the planet. Unfortunately, the disease grew so virulent that the arrival of Donald Trump as President was inevitable. 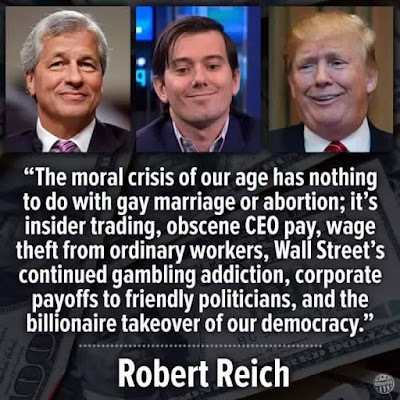 The cancer that Robert Reich implies has metastasized and now grown exponentially. Trump is as good of a symptom, cause, and result of that as we get to see. The only questions now are: How much chemo, radiation, and surgery do we have to bear until we, as a country and as individuals, are healthy again? And, how bad will it get until this country either rejects the tumors or throws in the towel and dies? "Unfortunately, the disease grew so virulent that the arrival of Donald Trump as President was inevitable. The cancer that Robert Reich implies has metastasized and now grown exponentially." Once more a statement of fact. A little history might give some perspective here. Who dereg'd banks (as the best example of this) in the '90s? Who was in power and refused to act in any way whatsoever right after the 2008 crash? Therefore, who was it that created the anti-blue vacuum that created trump and trumpism? And who is it that DWT wants us to support in November? hint: the answer to all those questions is the same. As much as I respect Robert Reich, he made a poor choice in 2016 when he chose to promote Her! By doing so, he was electing to allow the very excesses he now decries to have no challenger, ensuring that this dystopia would not end any time soon, if at all. The moral crisis of our [modern] age is the concentration of power. This is not a new phenomenon; in the past, the Magna Carta, the American Revolution (and Constitution) and French Revolution all attempted to redress inequity. The nuclear bomb and nuclear button epitomizes the immorality of such power - how is it moral to knowingly and voluntarily give power over life and death of humanity to one person (every leader with power to launch a nuclear weapon)? From an economic perspective, how is it moral for the few owners of Koch industries to fully control the livelihoods of 120,000 workers & their families, much less be so prevalent that it's impossible to not use their products. What is the moral justification for allowing a few bankers the power to crash the national economy and likely depress the world economy? SP, the concentration of wealth leads to the concentration of power, which you ably illustrated. Before wealth gets so concentrated, you need all parties to support it. I'll remind everyone that Reagan, bush, obamanation and trump all passed tax cuts focused on the very rich and corporations. In every case except this most recent one, democraps were willing and eager participants. This incentivized greed and supplied the wealthy and corporations plenty of capital with which to capture government and both parties. Prerequisite for all parties to support it in perpetuity, you need colossally stupid/lazy/gullible voters who never, ever force those who they elect to do anything differently. Sites like DWT splice into that progression somewhere. And even the well-meaning who cast votes for either party who support it are complicit. "In every case except this most recent one, democraps were willing and eager participants." Did you fail to note that a sufficient number of "democrats" just recently voted with the Republicans to essentially remove any restrictive regulations from the TBTF banks? I call that being "willing and eager participants". 2:45, yes, I stand corrected. I was referring only to the tax cut lege where democraps were largely nays... even though passage was already assured, so their sincerity can be questioned. But the democraps did not need to make the bank dereg bipartisan, yet they did so anyway. Yes, **THAT** is being willing and eager... and lustful and greedy.